If you are living up north, chances are you are dealing with some bad weather today. Today's wardrobe inspiration is about taking on the snow in a chic way. Whether you are hitting the slopes or relaxing somewhere enjoying a hot drink, you can still be chic in the snow! 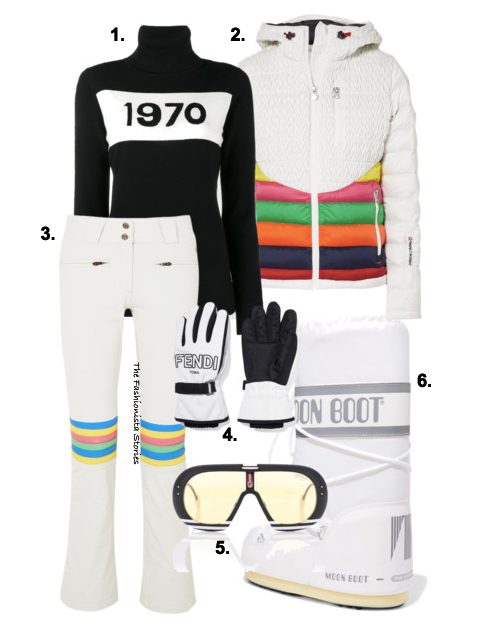 Style your way to the slopes with inspiration from this look. 1. BELLA FREUD 1970 Turtle Neck Jumper, available at FARFETCH. 2. PERFECT MOMENT 'Vale hooded ski jacket, available at NET-A-PORTER. 3. PERFECT MOMENT 'Aurora' flare ski pants, available at NET-A-PORTER. 4. FENDI two-tone shell ski gloves, available at NET-A-PORTER. 5. CARRIER 'Ski-II aviator sunglasses, available at MY THERESA. 6. MOON BOOT shell pique & rubber snow boots, available at NET-A-PORTER.